"The Blood of Jesus Christ Overcomes Evil"
THE NUN is the prequel horror movie to the CONJURING series, where this time a young nun and a priest go to an abandoned convent to investigate a nun’s strange death. THE NUN is well produced and has some overt Christian, moral references and themes of good versus demonic evil, but the theology is not always clear, and there are many scary scenes. 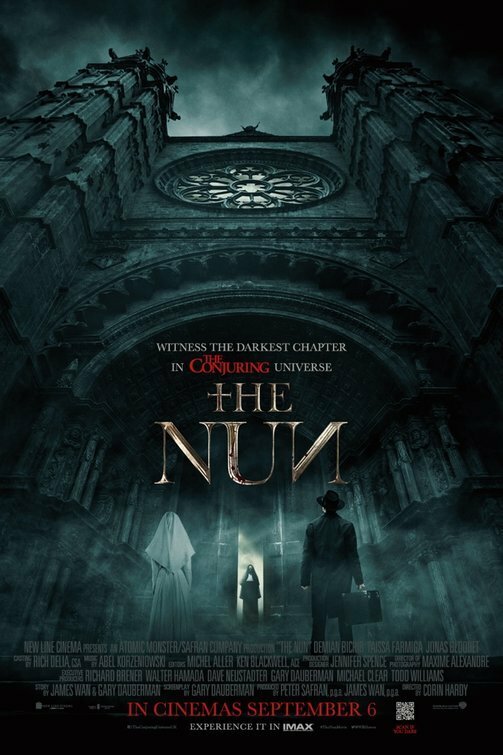 THE NUN is the prequel horror movie to the CONJURING series, where this time a young nun and a priest go to an abandoned convent to see if evil exists. THE NUN has some overt Christian, moral references and themes of good versus demonic evil, but the theology is not always clear, and there are many scary scenes. After a nun is found dead at an old convent in Romania, the Vatican sends Sister Irene and Father Burke to investigate. Father Burke and Sister Irene meet Frenchie, a French Canadian who found the nun’s body after she died. Frenchie is convinced to take Sister Irene and Father Burke up to the convent and leave them there for a couple of days. Frenchie takes an interest in Sister Irene, and it’s revealed that she has not yet taken her vows. After leaving Irene and Father Burke at the convent, Frenchie goes back to the town. Entering the convent, Father Burke and Irene see a nun dressed in all black covering her face. She tells them they are now in vespers and no one can leave the convent, but the two of them can stay in the sleeping quarters. Once Irene goes to bed, she starts to have nightmares and wakes up hearing Father Burke buried alive. Father Burke is deceived by a demon and pushed underground into a coffin. Irene has to hear the ringing bell and find him, though the demon is deceiving her and ringing all the bells at the tombstones. Praying, Irene feels directed to a specific coffin and digs Father Burke out. The next day, Father Burke does more research on the convent, finding out it was originally built by a man who used witchcraft and called on Satan, who is the Ultimate Deceiver of everyone. From this, they know they must clean this place of evil and bring in the Holy Spirit. THE NUN has a Christian worldview of good versus evil. The main character has a beautiful profession of faith in the middle of the movie. Ultimately, the blood of Jesus Christ is shown to be more powerful than any evil. Despite this, many nuns die because of the demon, implying that their faith didn’t protect them, including one nun who kills herself so the demon doesn’t possess her. We know, as Christians, that the battle has already been won on the cross. Having the Holy Spirit, we can’t be taken down by Satan, unless we aren’t following God’s Will and are walking in darkness. THE NUN is an intense, scary horror movie. The movie overall is well done, with great lighting to create a mood and good cinematography. Viewers who enjoy horror movies will enjoy this one, but it may not be quite as scary as the first CONJURING or ANNABELLE 2. Also, there are a few flashbacks that seem unnecessary and take viewers out of the story. THE NUN is the prequel horror movie to the Conjuring series, this time a young nun and a priest go to an abandoned convent to see if evil exists. After a nun is found dead at an old convent in Romania, the Vatican sends Sister Irene and Father Burke to investigate. They meet a young man they call Frenchie, who takes them to the convent. It’s revealed that the building was first made for witchcraft, so Sister Irene and Father Burke must cast out the demon inside the convent. THE NUN has some Christian, moral themes of good versus evil but doesn’t always have clear theology. The main character has a beautiful profession of faith in the middle of the movie. Also, the blood of Jesus Christ ultimately is shown to be more powerful than any evil. Despite this, many nuns die because of the demon, which implies their faith didn’t protect them. Also, for example, one nun kills herself, so the demon can’t possess her. Christians know, of course, that Jesus has already won the battle for us on the Cross.